The Ontario Progressive Conservatives are currently choosing their next leader, just months before the election. All this of course because of the allegations against the former leader, Patrick Brown, who is actually running again! This is the political equivalent of a soap opera, especially observed from an outside province like I do. Mainstreet released a poll yesterday with the voting intentions as a function of the potential new leader. We can therefore see that the PC is favourite with almost every single potential leader. The fact that Kathleen Wynne is incredibly unpopular most likely explains why the PC is in such an enviable position. I ran the simulations with every potential leader. The graph below shows the chances of winning (defined as winning the most seats, minority included. I'm not interested in talking about coalitions and post-electoral scenarios in this post. Let's keep simple for now). Despite having to find a new leader so quickly and so close to an election, the PC is still in a very favourable position in the sense that all but one of the potential leaders would, in all likelihood, win an election if held tomorrow. 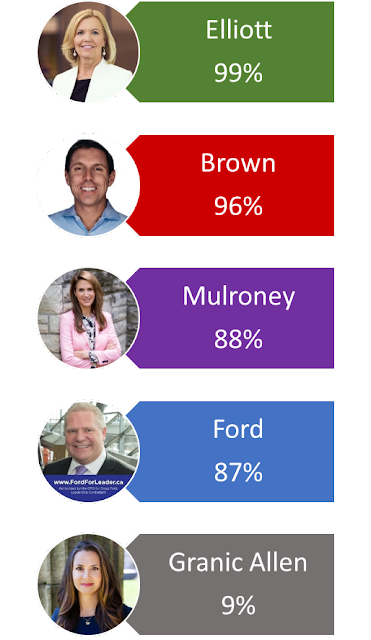 Elliott and Brown (who most likely has no actual chance of winning this leadership race...) have betters odds than Mulroney and Ford. All four main candidates would see their party leading the Liberals by 10 point or more. Let's face it, if the election was tomorrow, the only uncertainty would be to determine if they would get a majority. On this front, odds range from 46% for Mulroney to 87% fore Elliott. Please keep in mind that all of this is based on only one poll. While I think it's fair to say that Elliott would be better placed, both Ford and Mulroney could absolutely win a majority. Don't read too much into one poll asking people their voting intentions based on hypothetical and potential leaders. Note: in the following part of this article, I use the term GTA to talk about the close suburb of Toronto. I'm talking of the 905 area, going from Ajax to Oakville. It doesn't include the actual city of Toronto or ridings further away, such as Kitchener or Hamilton. No matter who the PC chooses as its new leader, it'll potentially face an issue in the GTA. This region has been relatively hostile to the PC over the last three elections. Yet this region might be essential if the Conservatives hope to get a majority (which might well be required in order to actually form the government). Look how the GTA is almost completely red. The problem for the Tories is that, if they want a majority, they'll need to do much better than that. This isn't the only path to victory. People always underestimate the potential paths, just ask Trump! But being shut out of the GTA makes it definitely a lot more difficult. 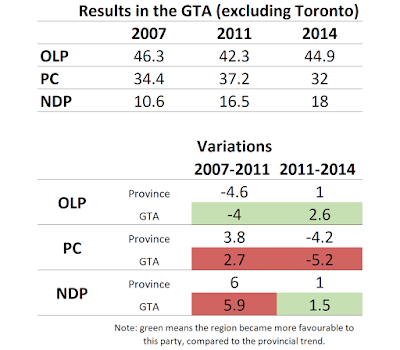 Also, I focus on the OLP vs PC race in this post but let's not forget the NDP. Not only has the PC usually been very unsuccessful in getting seats in the GTA - the PC only won 2 seats there in 2014, a drop of 5 compared to 2011- but the region has actually trended away from them! The table below illustrates my points. When the PC was increasing province-wide (like in 2011) it increased less in this region. 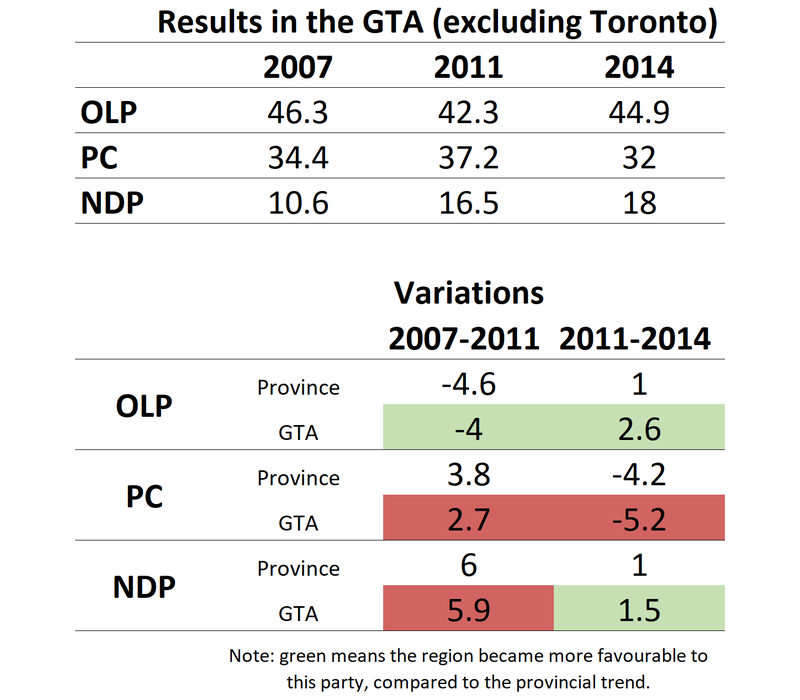 And when the PC was dropping provincially (2007 and 2014) it dropped harder in the 905. During the same period, the region was actually becoming more welcoming to the Liberals. This means that if you compare the 2007 electoral efficiency in the GTA to the 2014 one -which is the base for the 2018 projections- you get an increased electoral advantage of the OPL over the PC. Those among you who were asking me why the model was so harsh on the PC -in the sense that the OLP could win with significantly fewer votes- have their answers right there. You might think the difference is small but it adds up. 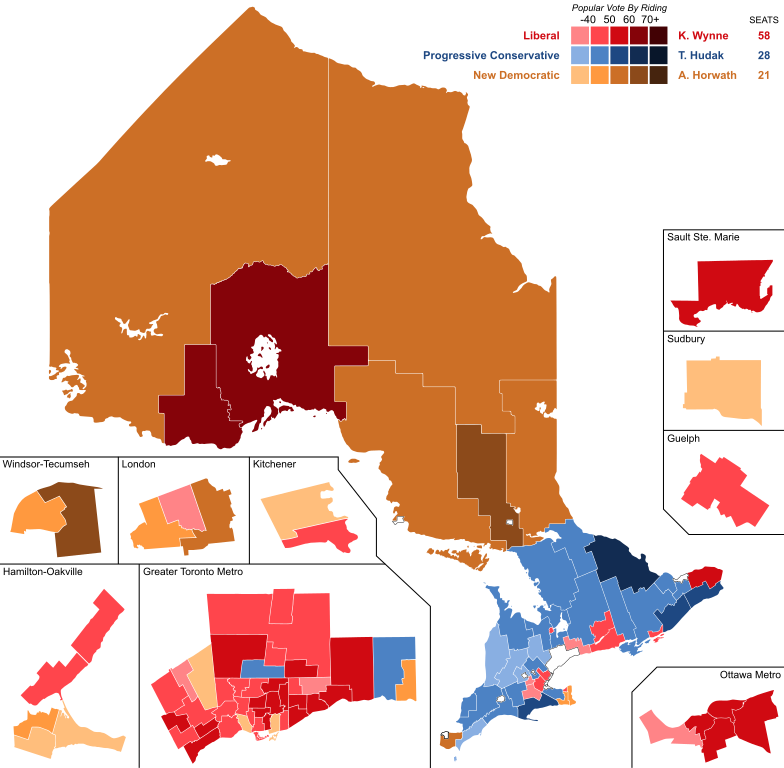 The PC was around 31% province-wide in both 2007 and 2014 but dropped by a little over 2 points in the GTA while the Liberals had a net gain -once the provincial trend is removed- of just over 2 points. This means that the net, combined effect is around +4.5 points for the Liberals in the 905! This is a massive electoral advantage. 1) A massive province-wide lead. If the PC gets over 40% and the OLP barely gets 30%, this will be enough for the PC to get its majority. Current polls show that the PC sits right around that margin. 2) An important break from recent trends in the GTA. I'm talking here of the PC getting a breakthrough in this region. The unpopularity of the Wynne government -along with years in power- might cause just that. The suburbs have often been very volatile in Canadian elections, although not for Ontarian ones. The BC NDP "won" the 2017 election by completely neglecting the interior and getting a mini wave in the GVA. Quebec elections have been incredibly volatile in the last 10 years mostly thanks to the 450. So it's perfectly possible the PC will actually win in the GTA. Current polls for this region (note: I'll have to double check with each pollster what they exactly define as GTA or 905) shows the PC well ahead there. So right now, it seems that option 2 might indeed be happening, along with option 1, so everything is sunny for the Tories. Polls have the PC ahead in the 905 in average by a margin of over 15 points -although it varies between pollsters with Forum being, as usual, way more bullish for the PC. 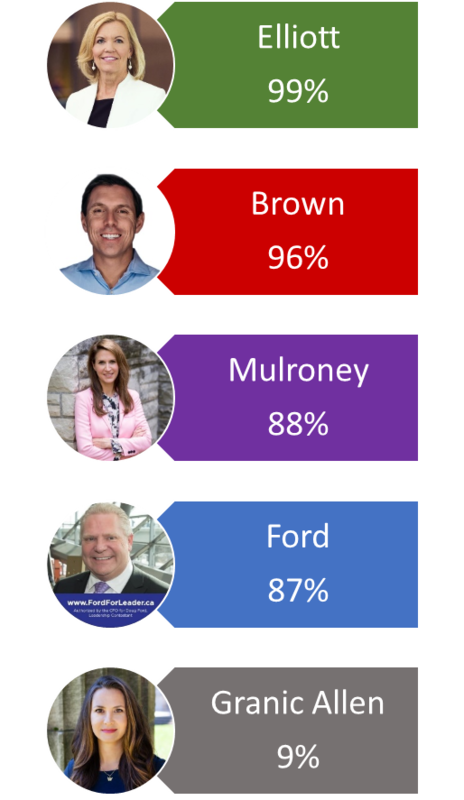 Also worth noticing that among the leadership candidates, Elliott and Ford are by far the ones doing the best in the 905 with Mulroney second worse. Stephen Harper successfully won seats in the GTA in 2011. For the next leader of the Ontario PC, this is likely the example to follow. Given the historical trends, you should understand my skepticism of the regional numbers of some of the polls. They show that not only the PC is ahead province-wide -something easy to believe- but the GTA would actually be a region where the PC increased more than the average! I'm therefore supposed to accept that a region that has been less volatile and way more hostile to the PC since 2003 would now be in PC-fever mode? That is possible, no doubt, it's just not the likely scenario I was picturing. The current model does NOT adjust for this, not yet. The GTA has been incredibly hostile to the PC over 3 elections. I'll need more evidence and convincing that the trend completely changed in this region. With that said, if polls continue to show this over the next couple of months, I'll naturally take it into account. But for now I'll stick to observed historical trends.